Wedge-tops are dynamic depositional realms that record tectonic activity of the underlying wedge. Depending on the position relative to an evolving thrust sheet, contrasting histories of deposition are observed. During the field trip we will visit the sedimentary succession in the footwall of the Inntal thrust at Flexenpass that records the transition from passive margin to synorogenic deep water sedimentation. The Gosau Group of Muttekopf on top of the Inntal thrust sheet documents transpressive shortening that led to the formation of fault-related progressive unconformities. The latter were recently described for the first time in this area (see Ortner et al., 2015). The succession of the Gosau Group, mainly deep water sediment gravity deposits, will be studied. 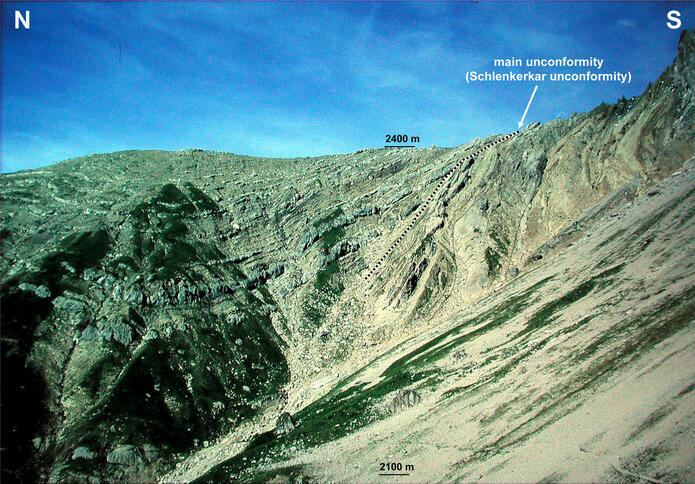 Some of the most prominent angular unconformities are exposed the vicinity of the Hanauer Hütte and will be visited during the field trip (Parzinn, Fundais, Schlenkerkar - see above reference). The distribution of different types of synorogenic sediments allows identification of Cretaceous thrusts, leading to a revised tectonic subdivision of the Northern Calcareous Alps. Whole day walks on trails in locally steep, high Alpine terrain (up to 2660 m asl., depending on weather conditions), some outcrops not on trails, maximum of 1000 m altitude displacement. Overnight stay at Hanauer Hütte (Alpine hut) requires a “hut sleeping bag” (i.e. a thin sleeping bag liner), hiking gear for high altitudes, rain protection. Please bring packed lunch for all three days. By mini-bus, from and to Innsbruck. 2 nights at Hanauer Hütte (mountain hut, 1922m) in dormitory. 23.09.2016 7:00 . Innsbruck, Bus parking area behind SOWI building. For those arriving by train possibility of pickup at train station of Langen am Arlberg at 8.15. 25.09.2016 evening. Innsbruck, Bus parking area behind SOWI building.